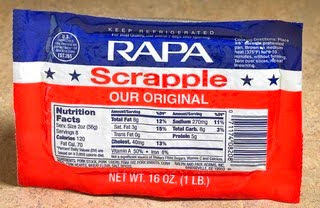 More than a Pair of Chutes: Scrapple, anyone? My facebook status update this morning was how we were having french toast and scrapple for breakfast. It set off a lot of comments about it. Most about how people love it, some about how they hate it, and a couple about how they don't know what it is. Well, it's not something that on paper is very yummy sounding. It's basically all the pig parts that can't go into anything else. We used to joke that they swept the floor of the processing plant and smashed it together to make scrapple. Ew. Okay, so it's not that bad. But, it does have some...questionable...parts in it. Namely, pork snouts. Yes, it's right in the ingredient list. Number 4, to be exact. After pork stock, pork liver and pork fat. So, are you grossed out yet? I'm not really grossed out by too many foods, but sausage is something that I can only eat if it's fried really crispy, and even then, I can only eat about half a link. I love the flavor, but can't stand the grissle. Sausage pizza - nasty. Once Rapa starts up their mail-order again, you should order a pack and try it. I think you'll like it. Or, next time you're in my area, stop by and I'll fry you up a big plate of scrapple, eggs and pancakes. You'll thank me! That is how we used to eat it...dipped in syrup!!!! It has been a very long time since I have had that...or even thought about that.